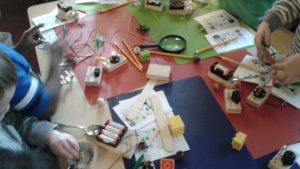 Kent has a company that teaches fun, hands-on, STEM based Science for students of all ages. 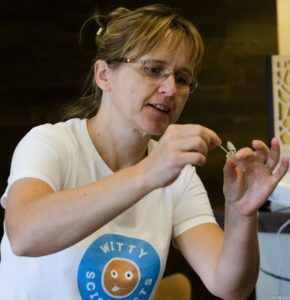 Witty Scientists was started in 2014 by Mariola Kulawiec PhD. Her mission is to feed curious children’s minds with science to increase their creativity. She wants adults to remember how curious and creative they were during childhood. Kulawiec grew up and earned her PhD in Poland, always dreaming of being a scientist in the United States. Fourteen years ago, she moved to Buffalo to work at the oldest cancer research institute in the world, Roswell Park Cancer Institute. She then moved to work at Fred Hutchinson Cancer Institute in Seattle, working in cancer genetics. While working there, a colleague asked her to participate in presenting some science experiments to the Fred Hutch Daycare Center kids. They wore lab coats, brought in real science equipment, and the kids were mesmerized. When her son was in daycare, she was again asked to volunteer. Kulawiec got some help from other parents and did a few more science programs. She really enjoyed it. When her fellowship grant ran out at Fred Hutch, she realized there was a demand for teaching science hands-on and decided to start a business doing just that. Kulawiec has teacher training, teaching college students while she was earning her PhD. “I never expected to teach kids,” she said. But it turns out she has the knack for it. Witty Scientists’ breakthrough came when she collaborated with the King County Library System. They were doing a summer reading program with the theme of “heroes” and she was invited to send in a program proposal. She designed four programs on women scientists. She covered their lives, including their childhoods, and they did hands-on science experiments based on what each scientist studied. The most challenging part was having to limit how many kids could participate at once. She has been invited back every year since. Her busiest season is the summer. This year she is doing two science camps in Federal Way and Green River Community College, the summer reading program for KCLS, and a preschool “Little Explorers” program at Kent Commons and Federal Way Community Center. Kulawiec collaborates with a friend who runs “KidGrowing Green Kids” on a camp whose curriculum has gardening, nutrition and science. 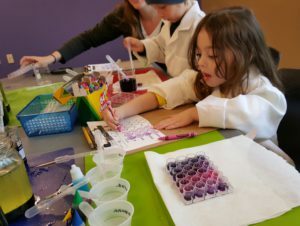 She also does some “After School Clubs” during the school year at Marvista Elementary in Normandy Park, Cascadia Montessori School in Redmond, and Covington Elementary. 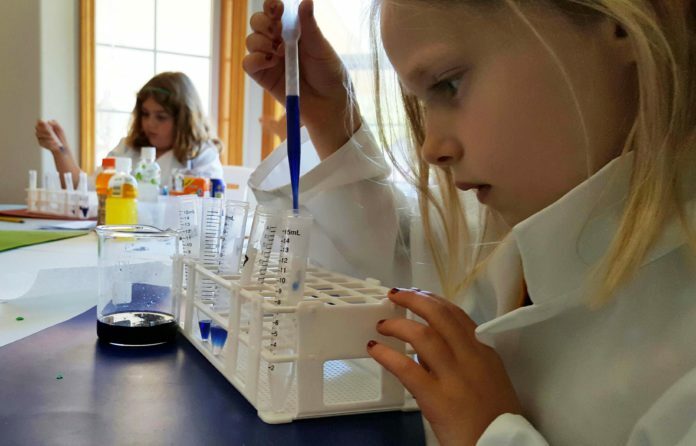 All of her programs have hand-on experiments with real lab equipment and even lab coats for the kids. She draws inspiration from three passions: to learn and understand our world, to nurture and educate children and to connect and learn from our parents’ generation. She has some assistants help her, but for now she is the only instructor. If she ever hired another instructor, they would have to really enjoy doing it because it’s very demanding and the quality of the lessons are very important to her. Her goal is to reach the kids who are bored with the idea of science from the beginning to get excited. When she does this, she knows she has succeeded. Kulawiec’s favorite part of teaching is the enthusiasm and interest she gets to generate in kids. “It’s very important to include kids in science,” she said. For example, one of her past students stopped by to say “hi” at one of her presentations. He told her that she got him interested enough that he found a channel on You Tube that had science experiments that he could do at home. That’s what she is trying to accomplish- infecting people with curiosity. A surprising thing she learned was that her accent isn’t the roadblock she though it would be. English being her second language, she was worried about communicating correctly, she thought it would be a hindrance. But many kids she teaches also have an accent and it makes them think that if she can do it, so can they. This has been true with adults as well. Many have told her that she has inspired them to go after their idea, teaching painting or whatever their “thing” is. What does the future hold for Witty Scientists? Kulawiec would love to have a lab located in Kent that she could teach from someday. But the main thing she wants to see is parents being enthusiastic about STEM learning. We need committed, proactive parents because school is not enough. Parent involvement is important. Kulawiec would like to stay near Kent. She loves the diversity of people. Diversity not only from different areas, but with different ideas. 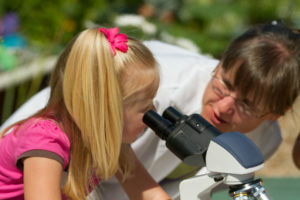 For more information on Witty Scientists’ programs, visit www.wittyscientists.com.